Both myself and Andy were invited down to Crust Liverpool on Bold Street to pop down for a meal and as soon as we accepted we began to look at the menu on their website. Upon first impressions we were ready to delve into the pizzas so we booked in for 6pm on a Thursday night. Once we arrived we were promptly seated and handed menus to have a look at including their drinks menu that had more than plenty to offer. 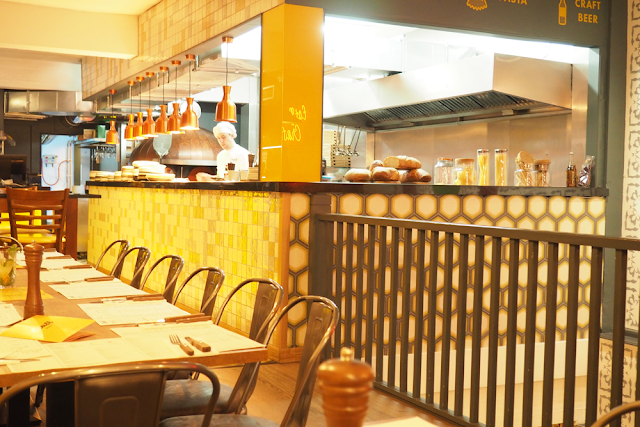 Looking at our surroundings it was clear that attention to detail was important at Crust, with the rustic vibe in the brickwork and the bright yellow feature colour to match their logo. After looking at the drinks menu for quite a while as I couldn't decide what to have, I opted for the Blackberry Lemonade which consisted of fresh lemon juice, sugar juice, blackberries, basil, soda and ice. It was true to word and was most definitely refreshing. Next time I visit I think I'll opt for a sweeter option as I have a huge sweet tooth and it was more on the tart side than sweet. 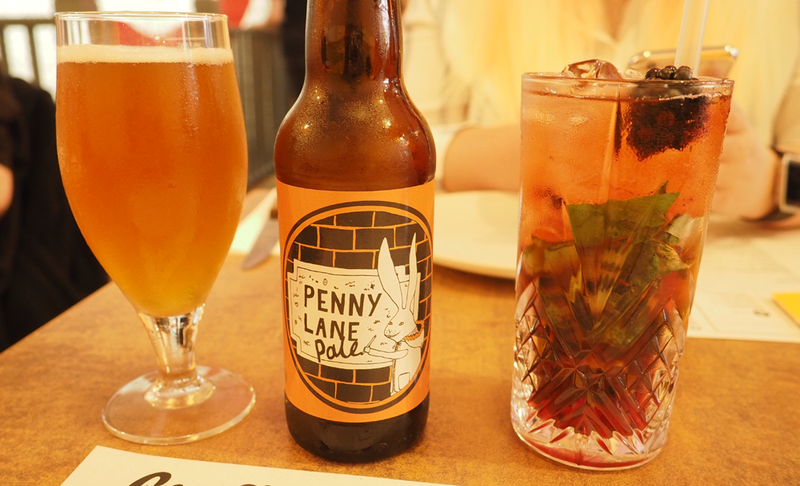 Andy opted for the Penny Lane Pale as he was intrigued to taste the local craft ales available. You can click here for his review that goes more in depth to how the ales tasted, as a 'the more sugar, the better' type of person I'm not one to drink beer etc. 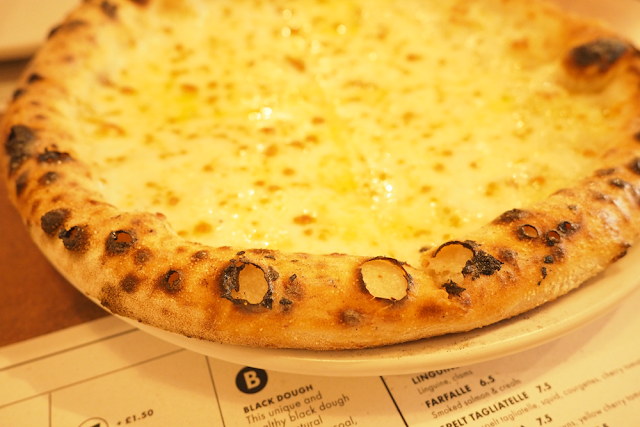 For starters we decided to split a Focaccia with garlic and cheese and it was the size of a small/medium pizza, leaving us relieved it wasn't any bigger or we wouldn't have had rooms for mains let alone a pudding. This is certainly the best starter I've ever tasted; the mozzarella was beautiful to pull apart and the garlic wasn't overpowering, finished with a thin base. I'm left with no doubt in my mind that I will return purely just for the focaccia, and that's a huge compliment from a foodie. For our main course we decided to split both dishes as we were both torn. I chose the Sausage Burger which included homemade sausages, sweet potato mash, fries and salad, topped with an Organic bun. 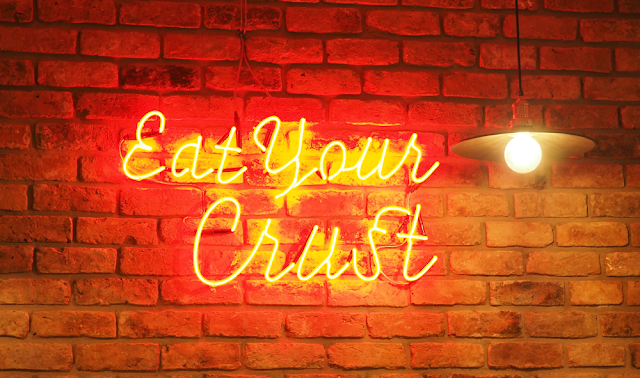 Crust offers tour types of pizza bases and I was impressed to see this also relayed onto the buns for their burgers. 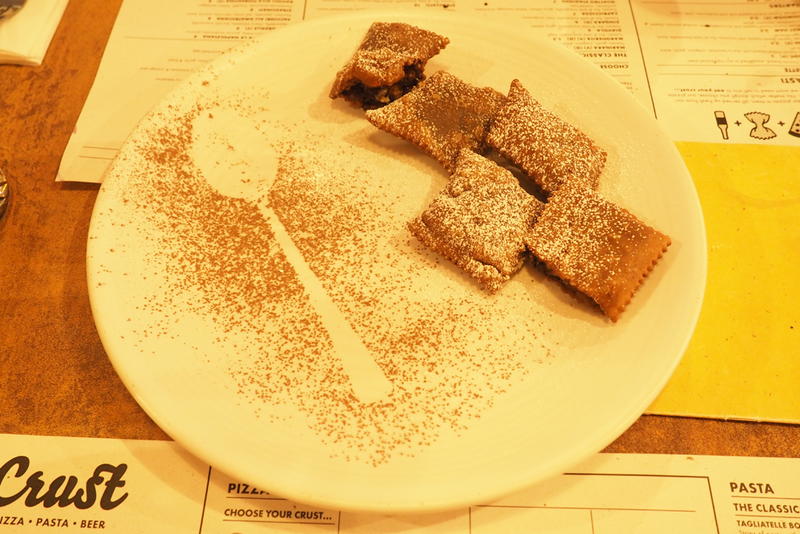 The organic dough is their premium dough made from imported flour from Italy. Aside from not expecting to have a choice in this, which gains extra brownie points, it was a nice surprise to not have a standard burger bun. The chips it came with were seasoned to perfection and I could have eaten another portion. 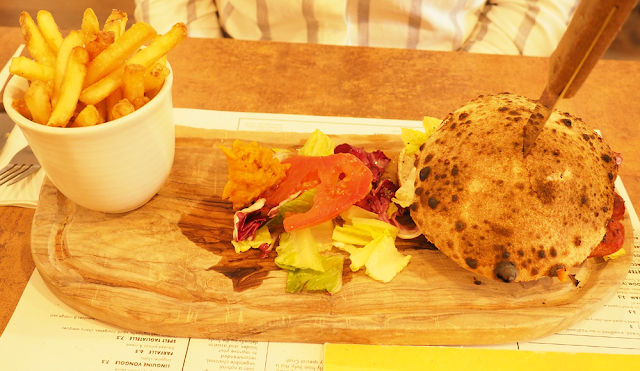 Andy chose the Pollo pizza on a Five Grain base that is a blend of flax, wheat germ, oat, spelt and rice flour to 'nourish from within'. 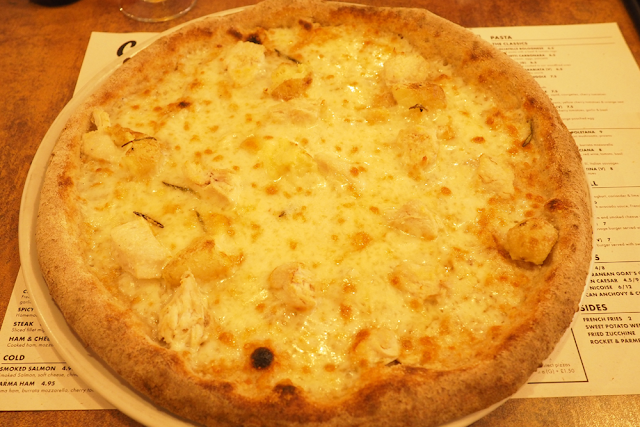 The toppings were fior di latte mozzarella, chicken breast, grated potato, parmesan and rosemary and it was lovely but I felt it could have used something colourful to add to the presentation of the dish. 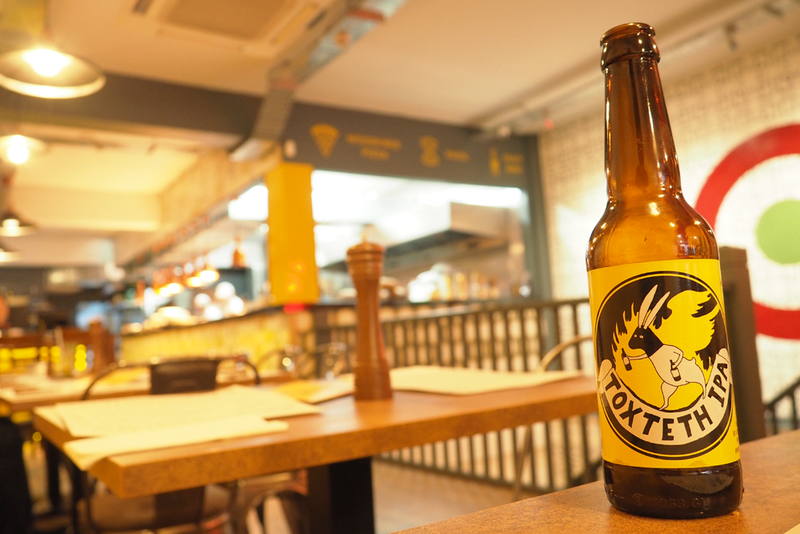 Before dessert Andy decided to try another ale out so chose the Toxteth IPA. I should have tried a cocktail out on retrospect but as I'm not a big drinker I kept sipping my lemonade. We decided to share a dessert and opted for the Ravioli Chocolate which was handcrafted sweet ravioli filled with a chocolate sauce, dusted with icing sugar and cocoa powder. It was unusual but delicious and finished off the night beautifully. In total it came to just under £40 which is outstanding for the amount of food and drinks you receive and is definitely one for students to take advantage of. I've promised myself I'll come back in the summer to try out their cocktails and Nutella pizza too. *Complimentary meal in exchange for an honest review.